EDGE has a built-in Electronic Data Processor (EDP) for field use. This feature allows for in-field detection and correction of data entry errors. In addition to highlighting cells containing incorrect values, EDGE has a dedicated column for representing EDP feedback. The example below shows three possible scenarios for content in the Alerts Column. 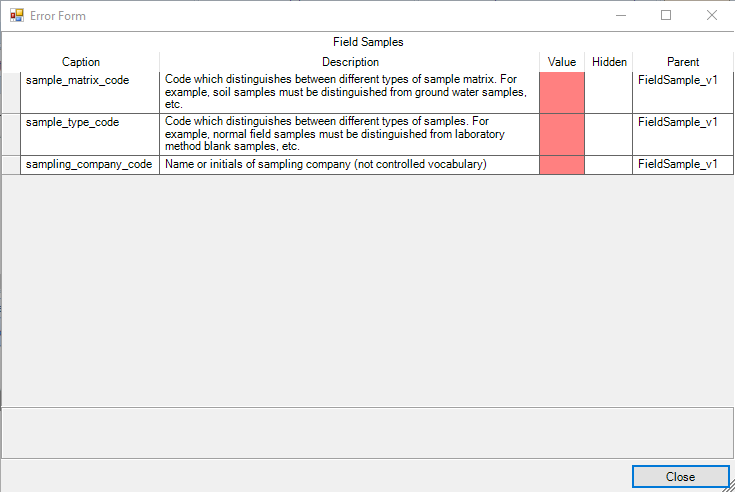 Field EDP detects errors, number of errors as stated (note invalid value for Location Code in above example). Clicking on the column in this case opens the Error Form, which can be used to resolve errors. Field EDP cannot detect errors as there is no EDD row present. Visible row is a placeholder row obtained from SPM scheduled data for current task/location. When a date and time are associated with the scheduled sample, these data are copied into an EDD row and the SPM alert is resolved. To review or resolve errors in fields that are hidden in the form or tab, click the Alerts field to open the Error Form, where values may be added directly.